Rocker-Lange Architects were awarded a honorable mention in the international design competition for a new bench design for the Kowloon East district in Hong Kong. The competition was held in conjunction with the 13th Venice Biennale International Architecture Exhibition, Hong Kong Response Exhibition. The redevelopment of Kowloon East will have a diverse array of spatial conditions, from new, open public waterfront parks to tightly planned former industrial areas. Traditionally urban furniture consists of repeatable standardized elements while being installed in various conditions. The problem with repeatable elements is that they don’t adapt necessarily very well to the specificity of each site condition. The key concept of the “Urban Adapter HK 2.0” project is to establish a system that can address the explicit conditions of each site, and to blend each bench with a variety of programs. The specific design methodology and the computer aided construction and assembly process allows making every bench unique while creating a distinctive family of urban street furniture that creates a merging identity for Kowloon East. This project with its unique user surfaces will have the capacity to place the user in a new position with the urban reality and its ecologies as much it may reposition the urban reality all together. Not only will it improve the quality of the public realm, it will also establish a new framework for use and for seeing and being seen in the urban streetscape of Kowloon East. The material for this street furniture will be wooden slats making it a positive sustainable contribution. The finish of the bench is made of climbing rope or rubber band finish. Each bench will have a distinct color out of a specific color family making each bench identifiable. The wooden slats are CNC cut, making sure that each bench can be precisely assembled. Rocker-Lange Architects are releasing their competition entry for the idea’s competition “Busan Opera House” in Busan, South Korea. Our project for the Busan opera house is an interior/exterior plaza for the arts, in which the public may engage with various art programs during the daytime and nighttime, in settings ranging from an opera to a public plaza. The design is an extended landscape intended for display and for being displayed, for engaging with the arts. Much of the scheme is a sloped ground, designed for seating and viewing. The interlocking of the urban fabric, the land, and the water in a single design creates a stage for the city, as much as it re-frames the city as stage. Public life, high-arts performances and exhibitions, as well as the beauty of Busan’s natural surrounding are equally on display. 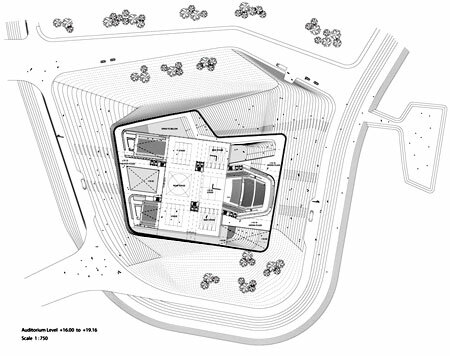 The exterior strategies for the design are continued inside, where the scheme promotes a continuity of the landscape in the public plaza beneath and surrounding the theaters and the opera. The public realm ‘folds up’ as a large landscape-like staircase in order to reach the large, suspended auditorium spaces inside and the viewing terrace on the roof outside. 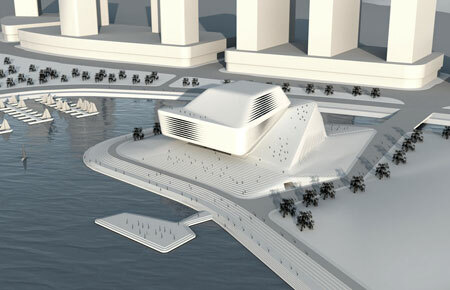 The design enables the public to participate in cultural events in and nearby the new Busan Performing Arts Center. The building’s public space is accessible throughout the day and night. The design of interior and exterior public space is suggested as a space and place of performances, of enactments informed through relationships as they unfold in time. The design is structured to stimulate and care for relationships, for the spaces in between. Upon arrival, different paths disclose the sites of performance on the sloped architectural-landscape inside and outside the building. The stages that may hereby be encountered are both fixed and temporal, as the performances energize them with life. Changing events, pattern’s of life’s activity, are anticipated rather than determined through the design. Located on a peninsula in direct proximity to the Busan Port, and the city center of Busan, our project aims to offer to Busan citizens a public interior and exterior space that is equally engaging the water as well as the park and the city scape. 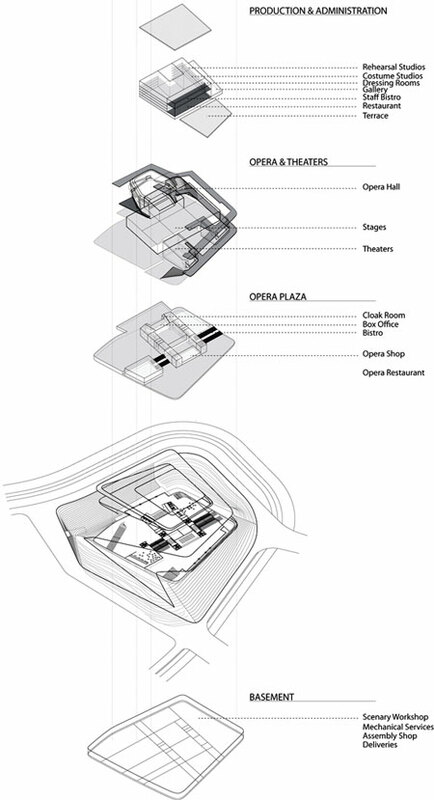 The opera is designed as a landmark, in the literal sense of the word, it is marking the land, marking the new cultural scape of Busan at the same time it is an icon for Busan. 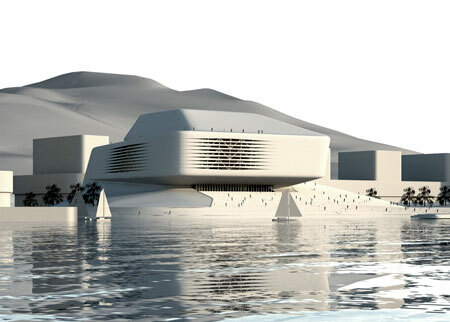 The overall structure of the opera is designed as a large habitable ground that slowly ramps from the water and the park up to become an architecture that allows the viewer to link to both the water and the city. The building becomes a stage located in the water, as it also stages the beautiful bay, the ocean on one side and the lively city and its skyline on the other side. Rocker-Lange Architects are releasing their competition entry for the idea’s competition “Fashion Museum Omotesando” in Tokyo. The design of a fashion museum on Tokyo’s renowned Omotesando district asks for a unique answer. 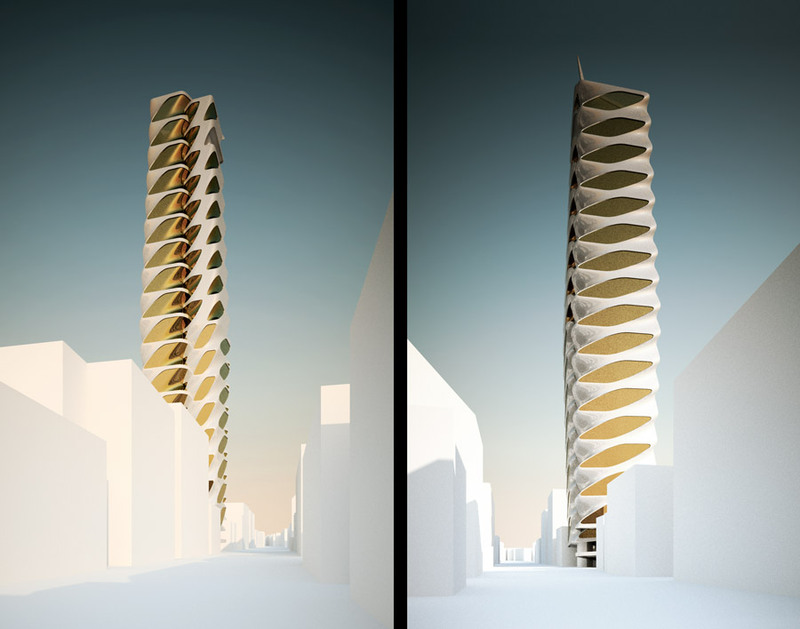 While the height of the tower in a low-rise area guarantees that the building will have an iconic flavour by default, one has to express still its significance and otherness in comparison to generic towers. 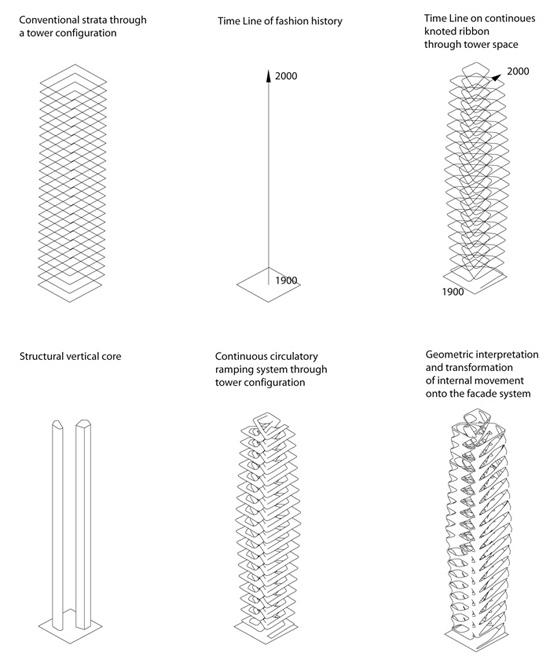 Conventional tower configurations lead usually to a stratified system. In order to avoid a disconnected and discrete spatial succession, this design utilizes the concept of an expandable and differentiable ribbon as a continuous organizational strategy. The ribbon that resembles a trefoil knot ensures that the narrative of the Fashion history is told in an uninterrupted way. The ramp is providing an easy access for handicapped people by maintaining a slope of 6%. The system ramps up the entire height of the tower and provides a user interface for a continuous experience in revealing the history of the fashion industry chronologically from the 1900’s to the 2000’s. Since the circulatory principal is the main concept behind the design, it is used furthermore to organize and articulate the façade system. 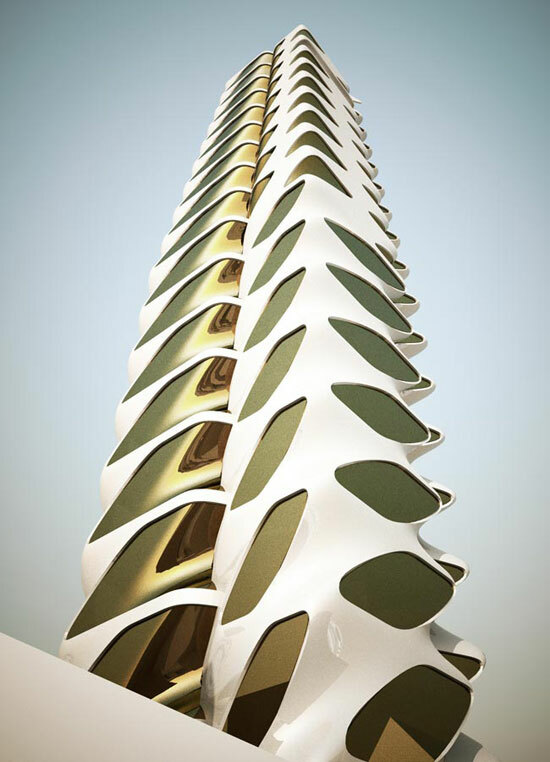 This outer membrane is a direct interpretation and transformation of the interior movement inside the tower space. 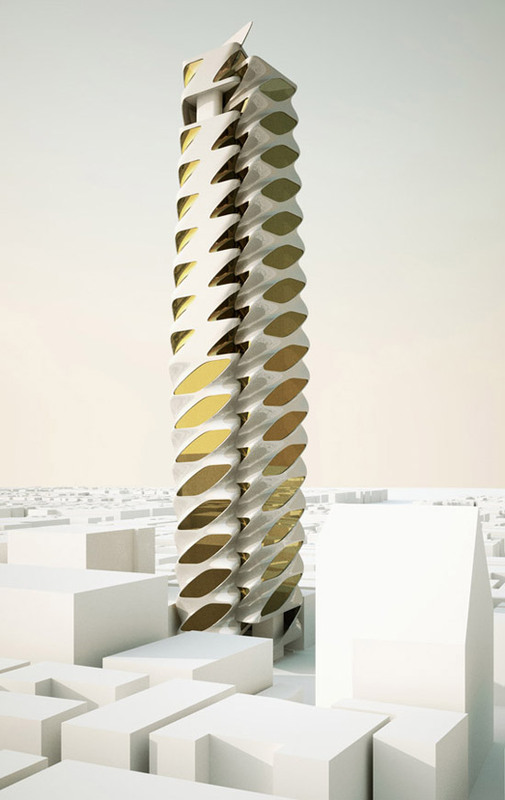 The design seeks to achieve a unique formal character and a unique spatial configuration by implementing cross scalar variation. By maintaining a uniform and holistic building envelope the proposal ensures a strong iconic identity for the building and the entire urban area of Omotesando. This enhances the unique and special atmosphere of this district. The façade material is made of white enamelled metal panels with bronzed tinted glass elements that provide sufficient protection to the exhibited fashion artefacts. The façade with its porous nature offers continuous and constant 360 degree views over the city of Tokyo. 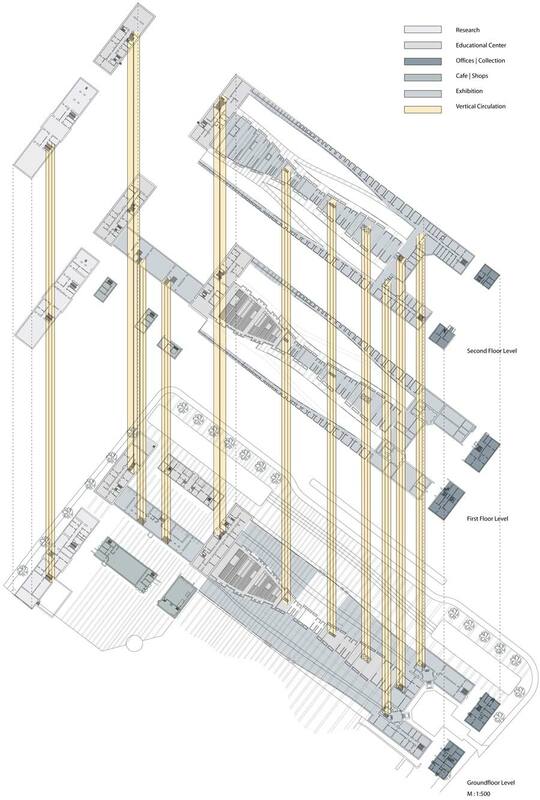 In order to provide maximum interaction with the ramping system the structure opens up an extended urban space underneath the building. The enclosed space of the museum is lifted up by 4.00 m to provide alternative relations with the urban surrounding. This way the ramp can be understood as an extension of the urban space by providing a gradual transition from exterior to interior space. Catalytic Connector – Museum of Natural History, Copenhagen. 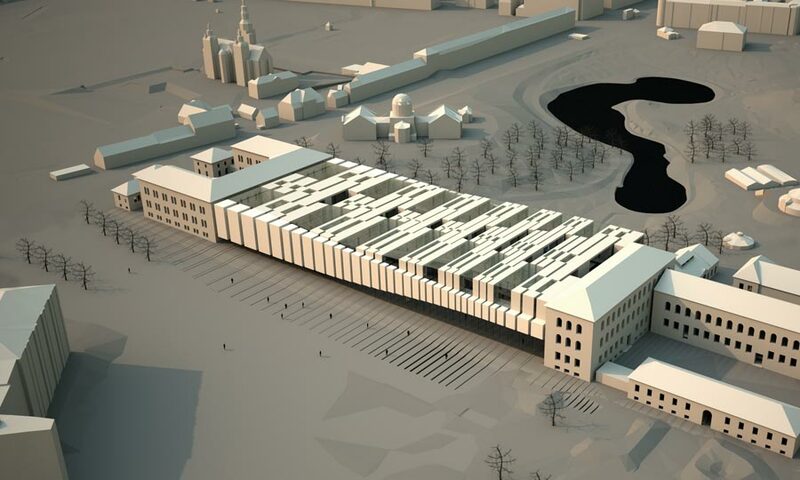 Rocker-Lange Architects are releasing their competition entry for Denmark’s New Museum of Natural History in Copenhagen. The proposed scheme serves urbanistically as well as architecturally as a catalytic connector: it connects and enhances the existing buildings with which it creates the new Museum of Natural History. It creates a visual marker in the city signaling the national and international importance of the new institution. The result is an open welcoming museum complex, embedded in the beautiful landscape of the botanic garden, surrounded by the traditional – renovated – brick buildings of the Geologisk Museum and the Solvtorvskomplekset. Embedded within the landscape the museum functions quite literally as a interlocutor between the natural- and the cultural-scape. Both the park- and the urban-scape flow in and through the building, creating public interior and exterior plazas, allowing for views onto the giant whale and dinosaur skeletons in the museum’s exhibition halls. 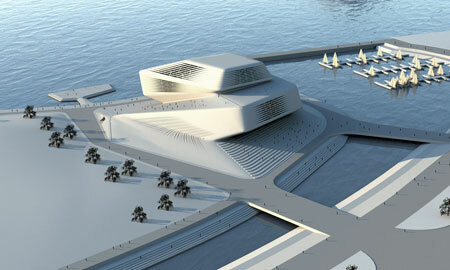 3 major exhibition areas traverse the new museum reflecting the different exhibition areas: Fauna, Flora, and Geology. The meandering paths traverse the exhibitions providing spectacular overviews and close insights into the museum’s collections. A variety of different spaces are inscribed in the building’s envelope: larger and smaller exhibition zones alternate, and special media presentation spaces are also provided. On the open floors swarms of animal species can be admired while in the smaller rooms carefully elaborated analysis are on display. Rocker-Lange Architects are releasing their proposal for the “London Bridge 800: Inhabited Bridge” competition. The proposal for a Living Bridge over the River Thames was one of the schemes of the Living Bridge Competition for the 800’s aniversery of London Bridge, London. 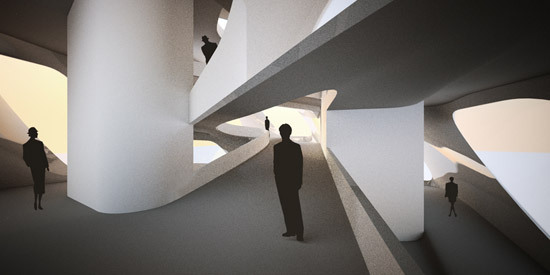 The scheme was selected by the jury to be included in several exhibitions in London and Manchester. The proposal seeks to readdress the typology of the terraced house in a contemporary interpretation by implementing the concept of cross scalar variation to achieve varying programmatic and formal identity and a unique spatial configuration. On the other hand the scheme provides a uniform and holistic building envelope for the entire composition on London Bridge, ensuring a strong iconic identity for the structure and the city. The bridge provides two main promenades that are situated on the perimeter of the bridge. While the east promenade is accessible to both, vehicles and pedestrians the west promenade is only accessible to pedestrians. Intervals of cross connectivity through the commercial folded landscape are structured by the terraced housing arrangement and generate an easy movement between the two promenades.